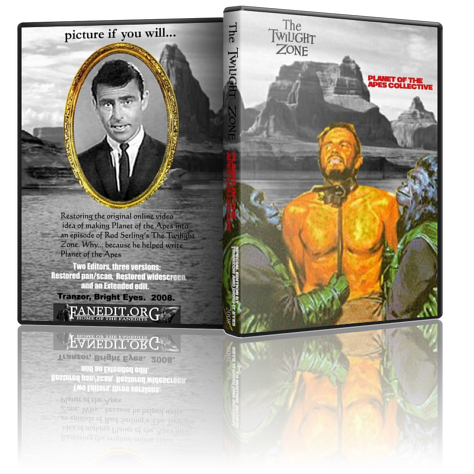 This fanedit DVD contains 3 different versions of the fantastic idea to create a twilight zone episode from Planet of the Apes. To give Forbidden-Zone’s great edit a DVD quality presentation with a few extra suprises. being from the UK the Twilight Zone wasn't a weekly show that was available to me, i can't recall if it was shown or indeed repeated over here. i do however understand the weekly premise as we had a similar show called Tales of the Unexpected. this edit i could only assume would fit nicely with any episode from the classic TV show, as it looks very authentic especially the fade to black in which a commercial break would have taken place was a nice touch. the only negatives regarding the edit would be a little more footage showing the bond between taylor and znova would have helped the narrative. also cornelius line about taylor proving their innocence seemed a little out of place with the footage that had been deleted. a continuity error is also seen as the army of apes appear a long the beach towards the end. I am honestly surprised to see how low I rated this edit originally. I actually wonder if I hit the right button. Being able to watch this edit in higher quality than the original MOV files is great.